Endless Hot Water – Tankless water heaters heat the water when you need it so your supply is constant. Space Savings – Tankless water heaters take up much less space than conventional water heaters. Lower Energy Costs – With tankless water heaters, you are only heating the water that you use so no more wasted gas or electricity giving you savings on your utility bills immediately. Longer Life Span – Conventional water heaters have an average life of 5 to 10 years while tankless water heaters can last 15 to 25 years or more. Environmentally Friendly – Tankless water heaters greatly reduce the consumption of energy such as natural gas in the home, as well as the power generated to produce electricity. It is estimated that the average home’s hot water energy bill is 30% of the monthly total. Although they require a larger initial investment, tankless water heaters use much less power, saving you money on your monthly energy bill. 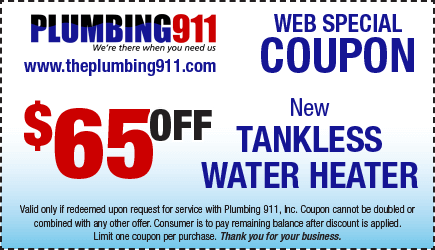 To get a more information on tankless water heaters, call the Cleveland/Akron plumbing pros at Plumbing 911 at 866-720-0911.